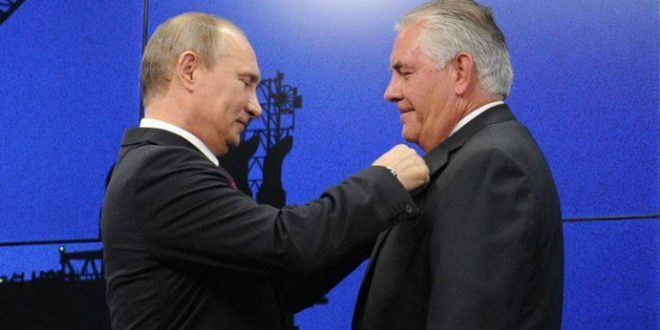 Rex Tillerson Spurns $80M Earmarked To Fight Russian Disinformation Campaigns, Funds To Expire Next Month - Joe.My.God. Secretary of State Rex Tillerson is resisting the pleas of State Department officials to spend nearly $80 million allocated by Congress for fighting terrorist propaganda and Russian disinformation. It is highly unusual for a Cabinet secretary to turn down money for his department. But more than five months into his tenure, Tillerson has not issued a simple request for the money earmarked for the State Department’s Global Engagement Center, $60 million of which is now parked at the Pentagon. Another $19.8 million sits untouched at the State Department as Tillerson’s aides reject calls from career diplomats and members of Congress to put the money to work against America’s adversaries. The $60 million will expire on Sept. 30 if not transferred to State by then, current and former State Department officials told POLITICO. The struggle over the money is a case study in Tillerson’s approach to managing the State Department and the frustration it is engendering among American diplomats.